Thanks to Daniel Davis and Saxifraga for helping me realise that you can use your iPhone as a midi junction box with ios7. They contacted me after reading about my experiences with the wonderful OP-1. What I have been doing tonight thanks to them is playing my teenage engineering OP-1 via my CME Xkey. The big deal is both units, although they respond to midi, only have USB ports on them and not the usual midi sockets. Previously the only way you could connect one USB midi device to another was if you were attached to a computer. The cool thing about both the OP -1 and the Xkey is that they are both pretty small and entirely portable. I had been seeking a way to achieve this without nessicatating the hassle of a laptop around for what should be a sitting on a couch/train/aeroplane kind of thing. 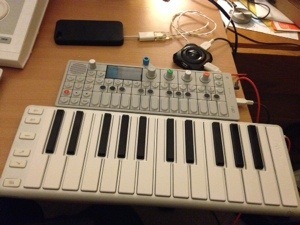 Using an app called MIDIbridge on my iPhone I have been able to achieve this. I have a USB hub with the two midi devices attached, then it’s plugged into my phone using a CCK (camera connection kit). Only with advent of the recent ios7 have iPhones been able to use the CCK. See my blog.